This quick and easy paleo pizza crust will be your new go-to whenever a pizza craving strikes! The ingredients mix together in one bowl and it’s ready in under 30 minutes. Top it however you like for any meal! Kid friendly, gluten free, grain free, dairy free. Anyway, I actually made this crust for a while in a large cast iron skillet, and topped with sauce and (GASP!) mozzarella cheese for the kids, but it took me awhile to actually get around to solidifying the recipe, AKA finally remembering to write down ingredients/measurements. 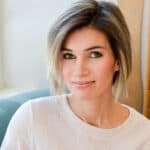 It turns out that some of my favorite recipes are also ones that take months to make it to the blog for this very reason. 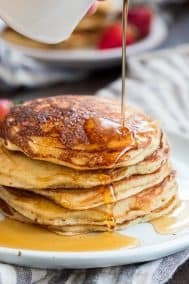 My “work time” is usually during the mornings after taking the kids to school, so all the “real-life” recipes I make for us sometimes fall through the cracks. And, it really is easy enough for a 5 year old (or almost 6, his birthday is tomorrow!) 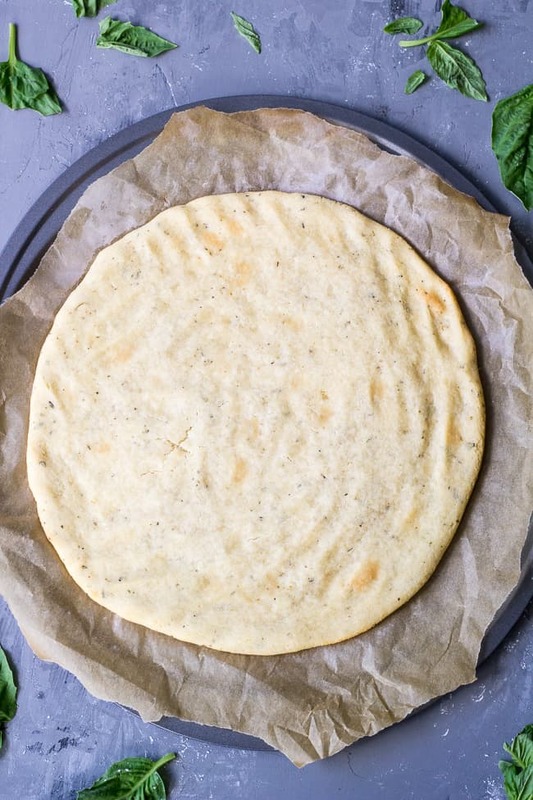 to make this paleo pizza crust from start to (almost) finish. 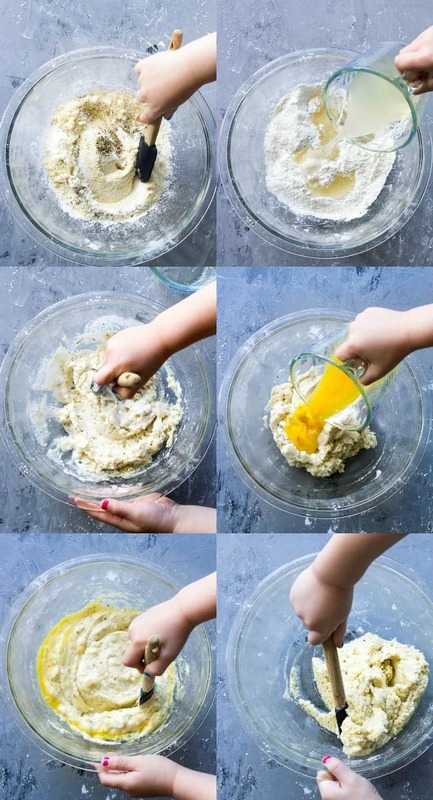 You simply mix the ingredients in a bowl and then spread out the dough! 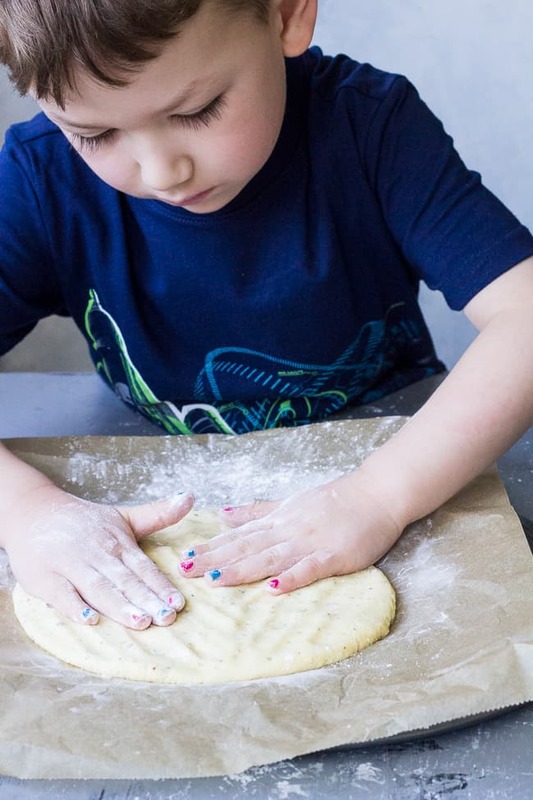 Don’t forget to sprinkle the tapioca flour over the top just like director-momma says to…the dough can be sticky but the extra tapioca (or arrowroot, if you’re using it) helps to easily spread the dough into a circle. That was of course, his favorite part. This recipe will make a 10 inch crust or a very-thin 12 inch. It’s meant to handle quite a bit of toppings so you go wild and make it super filling, or go light on toppings for a side dish or snack. We’ve done it all, and it’s a hit every time. Now for a couple of tips. First, since the recipe involves a decent amount of coconut flour (and we know how absorbent and tricky it can be) I recommend sifting it before adding. Also, after adding the egg, you will add the remaining 3-4 Tbsp of coconut flour, however as many times as I’ve made this, I’ve never added the full 4 Tbsp – it’s usually around 3 and 1/4 or 3 and 1/2. The dough will be warm initially and feel somewhat sticky, but the extra tapioca will help with that – don’t add too much coconut flour or you’ll get a grainy “stuck-in-your-throat” texture that I know all too well. When in doubt about spreading out the dough, add some tapioca, allow the dough to cool, and work with it slowly. I’ve even used a silicone spatula on occasion, especially when I’ve made it in my cast iron skillet. I hope you enjoy! Now let’s start cooking!! 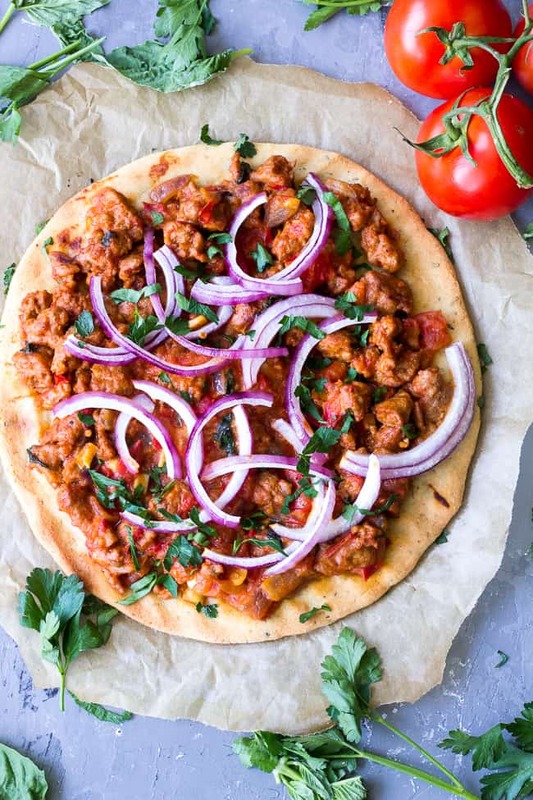 This quick and easy paleo pizza crust will be your new go-to whenever a pizza craving strikes! The ingredients mix together in one bowl and it's ready in under 30 minutes. Top it however you like for any meal! Kid friendly, gluten free, grain free, dairy free. In a large mixing bowl, combine the almond flour, tapioca or arrowroot, 3 Tbsp of the coconut flour, onion and garlic powder, Italian seasoning, and salt. Stir well to fully combine. In a measuring cup, combine the water, oil, and vinegar , then pour into the dry mixture and stir with a wooden spoon until a dough forms. Now stir in the whisked egg to combine well. 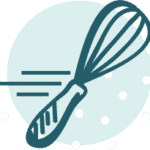 Once you have a sticky mixture, you will slowly add the remaining coconut flour. I recommend adding a Tbsp at a time and mixing well, allowing the dough to sit a bit after each Tbsp to absorb the liquid, until you have a dough that's still a bit sticky yet able to be spread out. Don't add more than 3 additional Tbsp of coconut flour in this step, even if the dough seems sticky to work with - you can use extra tapioca to help spread it out. 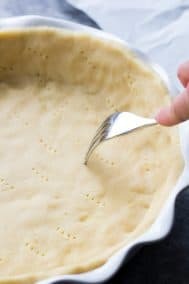 Sprinkle extra tapioca or arrowroot on your parchment lined baking sheet, transfer the dough to the sheet and sprinkle with more tapioca/arrowroot. 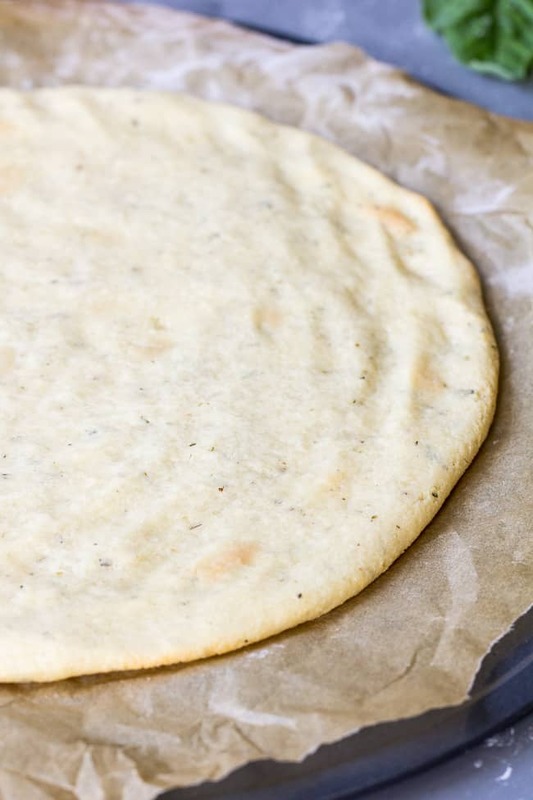 Work the dough into a 10 inch circle (12 for a very thin crust), then bake in the preheated oven for 10-15 minutes depending on how crisp you want the crust. I baked mine for about 10 minutes before adding my toppings, and baking again. Bake time will depend on the toppings you plan to add, how crispy you want the crust, and how thin you spread it out. Top your crust however you like! Enjoy! Want more fun and kid friendly paleo recipes? Try one of these! 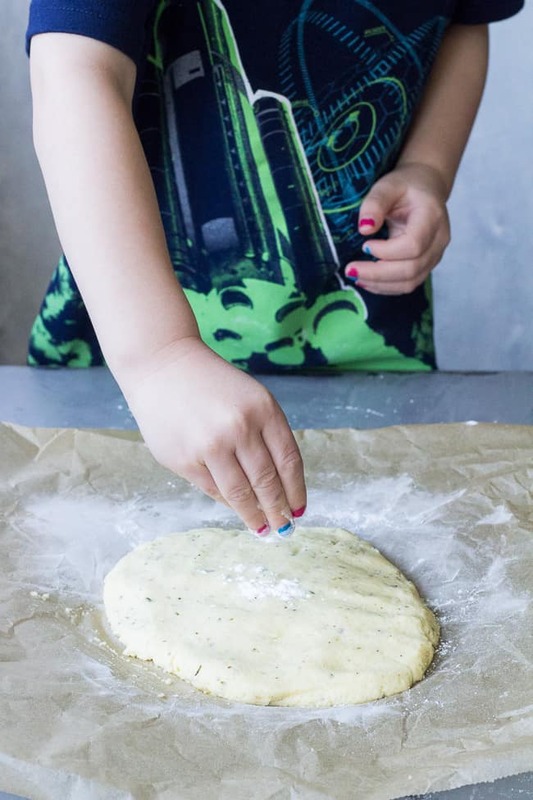 Do your kids like cooking with you? What their favorite thing to help with? This looks amazing! I’m excited to make it tomorrow for dinner! I’m just wondering if you have posted the recipe for what toppings are on the pizza in the picture? It looks delicious and I would LOVE to know what it is! Thanks! I have LOVED all your recipes that I have tried! Thanks so so so so so so much! This looks delicious – can’t wait to try it! How did you make it in your cast iron skillet? Was there a major difference, and which method do you prefer? I love that! I use my cast irons every day, they are my favorite way to cook so that’s the method I’ll definitely use. Making it tonight!? Hi have you tried freezing the pizza crust (after the initial 10-15 min baking time)? It would be nice to make these ahead if time. Awesome GF pizza crust recipe. Was easy to make & pizzas were a hit for dinner! Thank you!! I had tried a few other recipes which didn’t turn out well. This will be a favourite in our family!! Addit: making it again & added a little turmeric & coriander & made it into a focaccia bread with dinner – oh! So yummy! Did you use tapioca or arrowroot? 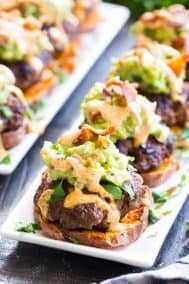 I was wondering if you had any paleo substitutions for almond to use in this recipe?? I’m paleo but also cannot have almond 🙁 and havnt yet found a good substitute. Any ideas would be so appreciated!! I would like to test your recipe but i need a substitute for coconut powder. Can i use rice flour? Or something else? Coconut flour is very difficult to sub for 1:1 since it’s uniquely absorbent and dense. Sorry about this! I made two of these tonight and they were very good! The only issue I had was with the bottom not holding out in certain areas. Taste was great though and I plan to make them again and hopefully fix the crust issue 🙂 Thank you! Thank you for another attempt at Paleo Pizza Crust. Unfortunately, the yield is not very large for this recipe, and I had to add a 1/2 cup of tapioca starch to make it even close to workable for my toddler to make personal pizzas. I’ll keep trying to modify, but honestly I haven’t found a good Paleo pizza crust yet out there. I have tried 4-5 different recipes and best bet so far is to use a Paleo pie crust recipe and just double the recipe and double the thickness if you like thicker crusts. This looks like a great crust! I am vegan though, so could I substitute a flax egg (or something else) for the egg? If so, should I also add baking powder to help with the rise? I’m not sure how a flax egg would turn out for this but it’s worth a shot, typically one egg is pretty easy to replace. I think the baking powder would be a good idea since flax tends to decrease the rise. Hi Ines – any luck replacing the egg? I’ve been DYING for pizza! Is this whole 30 compliant as well? No, because recreating traditional “junk” like a pizza isn’t considered compliant even if the ingredients themselves are. I have tried probably a dozen gf/paleo pizza crusts, and this is the best BY FAR. Thank you, thank you, thank you!!!! We have made this crust twice for pizza first time was just to try it out. We did change one thing we used garlic infused olive oil. It came out great much move flavor then the old style pizza crust the kids wanted. To us it is more like a moist garlic cracker so much garlic flavor! I’d pick this crust for a pizza over any crust I have had that’s saying a lot since I was raised in Chicago! We did not go 100% Paleo as we added cheese but we make a nice mushrooms, red onion and pepperoni pizza and a breakfast pizza with egg,cheese, bacon and turkey sausage. Thanks for the great receipt if you love garlic all the infused oil. That sounds absolutely delicious, might have to copy your recipe 🙂 So happy you guys like it! Super easy only recipe I’ve ever used. It’s my families favorite pizza dough. Sooooo Good!!! I had to substitute the coconut flour for casava four and I used unsweetened applesause instead of apple cider vinegar because of my allergies but it worked! I’m so excited to find a pizza and crust recipe that works for me. Pizza was my staple before I found out about my allergies. And I miss it. This is a keeper for sure! Thanks so. I have a little one with a coconut allergy! We LIVE on cassava flour ?! He misses pizza too, and I’ve yet to be able to recreate it for him. If you don’t mind me asking, did you sub 1:1 coconut to cassava? He likes the softer crusts, so did the cassava affect the texture at all? Thank you in advance ?!! So much! What did I do wrong? I’ve followed the recipe to a T so far, double checking all my measurements, and I have more of a thick batter than a dough, even after adding in the additional 3 tbsp of coconut flour. I’m going to try to continue, but I’m not very hopeful about how it’s going to turn out. I wonder if the oil/water mixture was a bit too hot. You might try chilling the dough just a bit and then using additional tapioca flour to press out the dough. Hope it worked out okay! The oil and water were about room temperature, so not hot at all. It baked up delicious and a great texture! I just couldn’t figure out why your pics look like a dough, and mine looked like pancake batter. I’m going to try it again tonight or tomorrow night and will be curious to see if it sets up any differently this time. My husband and I switched to Paleo a few months ago. We had been wanting a good pizza crust and we have found it!! We have made this many times already. I make ahead, bake, and store in fridge till we’re ready. I’ll try freezing one to see how that goes. We have even used it to eat for crackers with soups!! 😉 My coworkers were stealing some from me and I passed on the recipe. I printed off more recipes and am eager to see how they go. Thanks for sharing. Hi, just wondering how freezing it went for you? I just made this and want to freeze it as well but I’m not sure. This looks awesome! On my 4th week of Whole 30. Continuing on with more of a paleo diet and miss having my sprouted grain pizza . This looks like a great replacement. Appreciate you supplying the nutritional facts but just wondering how many servings for the 251 calories per serving? Thank you! 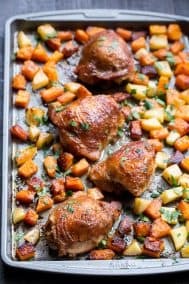 For this recipe, can you recommend any other type of oil I could use that won’t ruin the flavor/texture? I really want to try making this but my parents are allergic to olive oil! Thank you! Great recipe, tasty. Omg this recipe is great!!! I would even love it if I wasn’t eating paleo. I will definitely be keeping this one. Just made the recipe for the first time!! Luckily had some coconut flour on hand and the other ingredients. Made it in just under an hour from start to finish, even with entertaining a baby in a high chair. Totally love it! We eat Plant Paradox (Palio-ish) so I just topped it with shredded sheep cheese. Delicious!! I just made this pizza crust and it turned out perfect. It works just like the recipe said and held up well in my hand. I cooked the crust for about 13 minutes and it was perfectly crispy before I added the toppings. This my new go to pizza crust recipe and I like that there is no dairy in the crust. I’m thrilled you enjoyed this, yay! This is probably the sixth paleo crust recipe I’ve tried and it’s by far the best. This is the first time I actually feel like I’m eating pizza! Yum. Thank you so much! I following the directions exactly and used Tapioca Flour (finally found it at Whole Foods)…it turned out really great and crunchy! It had a nice flavor to it also….I ate the whole thing (well almost)….which is like 1400 calories! Ahh! So people beware…it’s delicious and you’re going to want to eat it all. Well happy you enjoyed it, lol! Delish!! Just made three pizzas!! Perfect!! Came out great for me. Thank you for the recipe. I used chia egg replacement and it game out great. Oh that’s great to know, glad it worked out! This is a fantastic recipe. I had bought a $7 box of Paleo pizza crust and this recipe is very similar in taste. Thank you! I love it. It is simple and really tastes good. My husband loves it. New to PALEO and struggle to find foods that I like. This pizza dough is a God send. I made a few changes do to dietary restrictions. I used 1/4 cup of Cassava flour for the 1\2 cup almond flour. And as used 1/4 cup applesauce for the egg. Worked great! What would be a good substitute for the almond flour…allergic to almonds! Hi! Always looking for a good grain free/dairy free pizza crust, so thank you for this! My son has to be egg free too, do you think a gelatin egg would work in this recipe? Hi! I’m not sure but it sounds like it could since we’re just replacing one egg, I hope it works out! 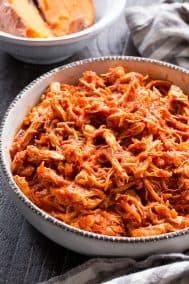 My wife and I have tried a few of your recipes now and after sitting down and enjoying a delicious chicken pizza based off these bases I thought we had to leave a positive review! This turned out SO well!!! I wish I could post a pic here of my beautiful pizza. It was perfect! Firm with crispy edges, and you could hold up each piece without it falling apart (a problem with other almond crust pizzas). My toppings were a thin layer of pizza sauce, sliced tomatoes, scallions, garlic, and zucchini. When it was finished, I added diced avocado. I put it in the oven for 12 mins, added toppings, then baked for another 4. I live in Denver (5,280 ft. – high altitude) and found this timing to be perfect for a firm, lightly crispy crust. This is a definite winner, thank you so much! Awesome! Thrilled to hear you loved it! 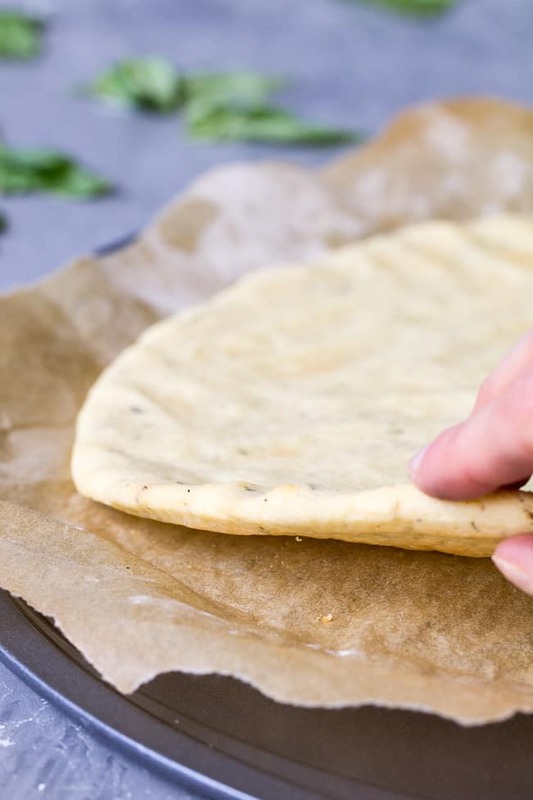 Have you tried to freeze the crust either before or after baking? I try to double recopies and freeze for later if possible. I haven’t tried it BUT I’ve frozen my cinnamon rolls after baking which use a similar dough and they reheat well. Hope this helps! Can egg replacer be used? Best paleo base I’ve found, by far. It holds so well, you can pick a piece up and eat it. No strong flavour so suits any type of topping. Brilliant! This is the best grain free crust I have ever made and eaten, my search is over! Oh my gosh! This recipe is so easy to make and so delicious…. I have made this recipe several times now and it is wonderful!! I actually crave this crust! I did make a few changes: less salt (original recipe was too salty for both my husband and I, so I only used about 1/4 tsp the last few times I made it). And I also used a almond/coconut milk blend in place of the water. Both changes are just personal taste preferences. Again, fantastic recipe! I find myself imagining new recipes using this crust. This crust is so so amazing!! I did not miss my old ways at all 😉 Thank you for taking the time to create it Michele! I am only a month into eating Paleo and am excited that I can still have pizza now and then. I’m wondering if you would consider creating a Paleo “dessert” pizza with this crust base? 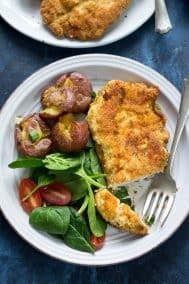 Awesome gluten free crust! I baked it too long so it was a little crisp but that was my fault not the recipe. I did 15min next time I’ll check at 10. Will definitely make again!!! 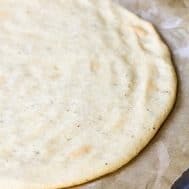 Has anyone tried making this crust and cooking it on a pizza stone? I would be curious to see how it turned out! I may have to try it tonight and see how it goes. It turned out great on my pizza stone!! Love love love this one! It is my go to all the time! I have to say — that crust was AMAZING. My picky 2 year old son even loved it! I didn’t have plain tapioca powder (and not enough arrowroot), so I did a combined arrowroot and self-raising flour (tapioca, potato, rice, maize, and the raising agents). The dough itself wasn’t like a typical pizza dough, but it baked very well! It tasted like REAL PIZZA!!! I’m definitely going to repeat this recipe! Thank you! I want to make Stromboli with this, I’m wondering about how long it would take to cook and think I should add a little extra tapioca flour. Any thoughts? @vanessa did you do stromboli? Calzone? Anyone? Like many other commenters, we’ve had bad luck with other paleo pizza recipes. This one was much better, even though I did make a couple small changes – I replaced the almond flour with cassava and only added a total of 5 Tbsp. of coconut flour, as the dough seemed a bit dry. Next time I’m going to bake it longer to get a crispier crust and add the full amount of coconut flour. Either way, we’re happy to have a crust that’s yummy, quick and paleo-friendly! Thank you so much! My husband and I made your recipe tonight and it was absolutely delicious!! We made two… one small with chicken and bacon, and another larger half marguerita and half sausage and onions like your toppings suggestion. Thank you so much! We did add a little bit of baking soda to the one of the doughs and it came out great and a little ticker. Delicious! I usually dread making paleo pizza crust bc it’s always to liquify, doesn’t roll out, ends up being soggy and I end up being frustrated. This crust was amazing!! 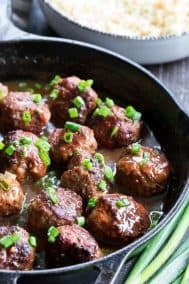 Easy to make and both my husband and I loved it!! I put some tapioca flour on parchment paper, then put the dough on it. Put more flour on top of the dough, covered it with parchment paper and then rolled it. Due to the flour, the parchment paper peeled right off. Baked it on the parchment paper and it got really crispy. Since it crisped up and didn’t stick to the parchment paper, after the first 15 minutes I transferred it to a pizza stone, added toppings and baked again. It was amazing!!! This crust is amazing! My whole family loves it and the dough smells amazing! Tried your pizza crust tonight! My son and I liked the way it cooked up – sturdy, just crispy, but still soft inside. But we don’t care for the vinegar. Well, I’m not supposed to have it & this was my first food with vinegar in it in weeks, and boy could I taste it. And my son noticed something tasted different, though he didn’t know it was vinegar. What is the purpose of the vinegar in the recipe, and what would be a good substitute? Hi. I just made an almond flour crust and it tastes like almonds. Not good at all. So I was wondering does this have an almond taste to it. I am grain free and looking for a pizza crust that taste like pizza and not almonds. I like that yours has a blend of floors. What does it taste like ? This was good. Made it with arrowroot as I didn’t have tapioca. I was tired and accidentally put in the coconut flour with the rest of the flours and it turned out just fine. It was great since it was pizza night (first one in a long time) and I had to make my personal pans from scratch as I can’t have wheat. Good recipe. I made this pizza crust and I loved it! I definitely going to make it again. I made this today and it was amazing. Everyone loved it. I have a teenage daughter on the autism spectrum that hates food and has sever food allergies. She was very hesitant to try yet another attempt at pizza. We went from just try to not spit out a bite to her going for seconds. Thank you!! I’m making it now! Wish it was dinner time already hah. I’m wondering, can you freeze this dough somehow? Maybe after its rolled but before baking? Or par baking? Have you tried anything? I made this tonight for the first time and OMG we LOVE it!!!! I just followed the recipe and it came out perfectly. We used cheese and tomato sauce like regular pizzas and it’s soooo good!!! The whole family loved it!!!!! Our new favorite!!!! The crust looks delicious. Just wondering if the almonds need to be blanched or would raw almonds (skin on) work just as well? Thanks. Can’t wait to try it! I always use blanched almond flour! the best grain free pizza crust I’ve had, well done!!! WOW! Thank you for sharing this amazing recipe! It’s so hard to find a gluten free/grain free/dairy free crust that you can actually pick up (especially when loaded with toppings). It was a little sticky when trying to pat it out but having my hubby continue to sprinkle tapaioca flour helped. This could have been you fault as the pan accidentally got a bit warm from the residual heat coming from our oven (it was sitting on the stove top). But other than that, this recipe was absolutely perfect! Also, side note I substituted coconut vinegar since I didn’t have ACV on hand. My entire family absolutely loved dinner tonight! Thank you for such an awesome recipe!! Best paleo “bread” recipe i have ever tried! The pizza crust was a great substitution of a traditional wheat crust. Love this recipe. I used dairy free pesto as the base and it tasted soooo yummy. This is better than any GF pizza crust I’ve ever gotten. I followed your recipe to the letter and ended up with a liquid batter rather than a “sticky dough.” I am not sure whether to try adding more almond flour or to pour it onto the pan as-is. Any suggestions for egg replacement? I’m dying for some pizza but can’t do eggs. Thanks! I used a chia egg and it worked great (I’m sure a flax egg would work as well). I also wonder if you could do it without egg. The consistency before the egg and the extra coconut flour went in seemed like it would be bake-able as it was, but I didn’t try! 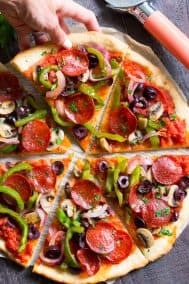 our go-to paleo pizza crust, and I’ve tried countless recipes before I came across this delicious one from you. This THEE best paleo pizza crust I’ve found. I’ve made it 3 times. The first time I did it exactly as posted. I turned out great. But the second time I did something different and it was ‘spreadable’. So, that’s what I did…I spread it on the parchment paper and it turned out great. So the third time I made it spreadable again and again it was amazing! Thank you! it is now my go-to recipe for pizza crust!! Hi! Glad you enjoyed! What did you do differently? This is so freaking delicious! 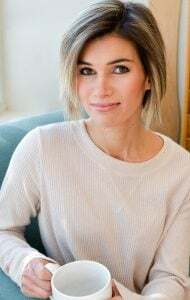 I used a chia egg (real eggs make me break out) and it was perfect. So awesome to get to enjoy pizza without messing me up. Thank you!! Can’t wait to try this but before I do wondering if I can use anything to replace the tapioca or arrowroot? The best paleo pizza crust I’ve found- thank you for giving me back one of my all time fave foods! OMG was that good pizza. I haven’t eaten pizza in 7 months. Really really! Good! Thank you so much thank you for all the trouble you go to trying out new recipes for us to use. We are so fortunate to have you working at it so we can use it with few problems. The pizza was wonderful. Loved looking at your son illustrating. Have 3 myself. This is by far the BEST & EASIEST paleo pizza crust I’ve ever had. It was so perfect! I’m going to use this for life & see if I can make garlic bread sticks and other things with it! <3 THANK YOU SO MUCH! !